The Department of Defense (DoD) procurement process is the backbone for developing DoD military capability. It’s govern by the policy and principals of DoD Directive 5000.01 “The Defense Acquisition System”. The system is divided into three main processes; (1) The Defense Acquisition Process, (2) the Joint Capability Integration Development System (JCIDS), and (3) the Planning, Program, Budget and Execution (PPBE) process. Each of these processes plays a critical role in the development and procurement of DoD military capability and forms the overall acquisition system. (1) The Acquisition Process: The Defense Acquisition System manages the development and procurement of DoD weapons systems. It’s governed by the Department of Defense Instruction (DoDI) 5000.02. The instruction is based upon policies but allows for de-centralize execution. (2) The JCIDS Process: The Joint Capabilities Integration Development System (JCIDS) was established by the Joint Chief of Staff. It’s primary purpose is to assess and resolve gaps in military joint warfighting capabilities and control the requirements generation process. The JCIDS guidance (CJCSI 3170.01H and JCIDS Manual) was developed by the DoD to effectively integrate capabilities identification within the acquisition process. 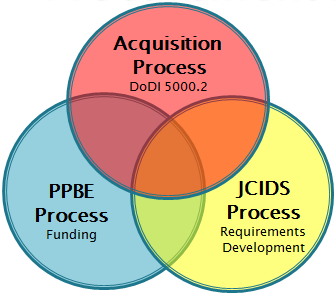 (3) The PPBE Process: The Planning, Program, Budget and Execution (PPBE) Process is used by the DoD for strategic planning, program development, and resources determination for current and future warfighter programs. It’s used to develop the plans and programs that satisfy the warfighters needs. Integrated Product and Process Development (IPPD) is the DoD management technique that simultaneously integrates all essential acquisition processes and activities through the use of Integrated Product Teams (IPT) to optimize design, manufacturing, and supportability processes. IPPD facilitates meeting cost and performance objectives from product concept through production, including field support. The Defense Acquisition Guidebook (DAG) is the main guide that details the overall DoD acquisition and procurement process. It provides the detailed guidance for the development, execution and disposal of all DoD acquisition program. 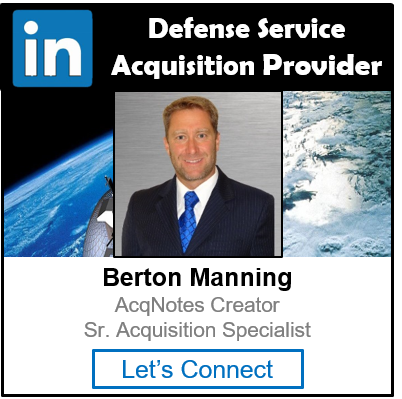 It’s designed to complement the policy documents governing DoD acquisitions by providing the acquisition workforce with discretionary best practice that should be tailored to the needs of each program. The Defense Acquisition Guidebook (DAG) is the overarching guide for the DoD procurement process. It should be your starting point for researching acquisition topics. The Program Manager Toolkit gives a great overview of topics associated with the acquisition process and Program Management.